What is Connection pooling in Python and How to implement it in Python? What are the benefits of using connection pooling? If you have all these questions, then don’t worry. 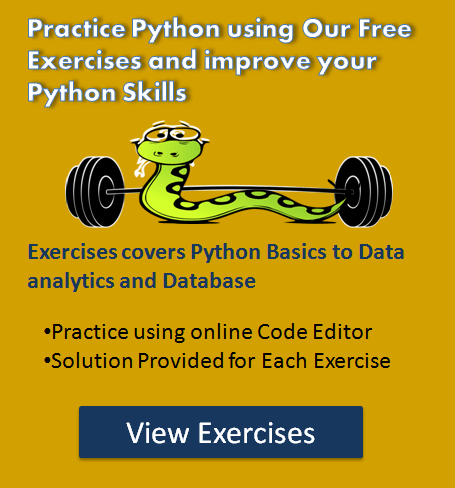 This article provides information intended to help developers to implement a connection pooling for Python database-centric applications. First, this article provides an overview of the MySQL Database connection pooling. Next, it provides examples of how to use the mysql.connector.pooling to implements connection pooling for your Python applications. Finally, This article provides an example showing performance benefit you can achieve by using connection pooling while developing a MySQL database application in Python. Note: We are using MySQL connector Python module to implement connection pooling. Connection pooling means connections are reused rather than creating each time when requested. Establishing MySQL connection through python is resource-expensive and also time-consuming, primarily when the MySQL connector Python API used in a middle-tier server environment. i.e., Middleware that maintains multiple connections to multiple MySQL servers and requires connections to be readily available. For Example, Your application uses database very frequently may be for data retrieving or data updations. To handle every new request application is creating a new MySQL database connection and after completion of a request, the connection gets closed. Again for a new request, the application establishes a new connection, and this process repeats for every new request. If you analyze this situation, you can easily find that application spends most of the time in creation and closing the database connection object. In this type of environment, we can improve application performance using connection pooling. To facilitate connection reuse, a memory cache of database connections, called a connection pool, is maintained by a connection pooling module as a layer on top of any Database driver product. Connection pooling is performed in the background and does not affect how an application is coded. The maximum connections supported by the Database module. 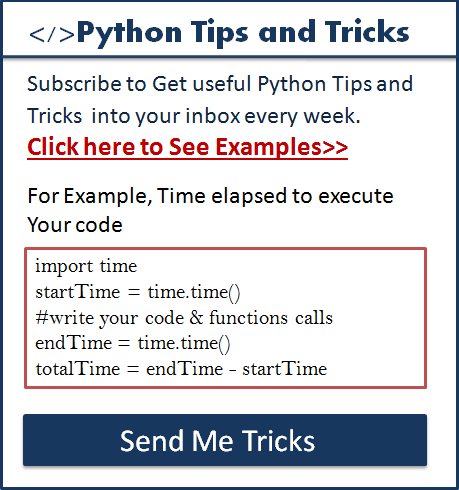 For example, the MySQL Connector Python supports a maximum of 32. The size and nature of your application also, how a database intensive your application is. The size of the connection pool is configurable. You need to provide a connection pool size at the time of its creation. You cannot change size once created. The number of the connection object depends on the above factors. For many cases one connection per thread handling a single HTTP request is sufficient. Alternatively, you may need fewer if not every HTTP request needs to access the database. You can check the previous request history and analyze your application nature and then decide how to configure the connection pool. Get Connection from a connection pool. Perform some database operation on it. Close the connection instance (return it to the connection pool). 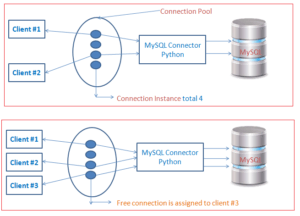 Let see how to create a connection pool using MySQL Connector Python to handle the MySQL database from python application. MySQL Connector Python’s pooling.MySQLConnectionPool and pooling.PooledMySQLConnection class provides the instantiation and management of connection pools. pooling.MySQLConnectionPool class constructor instantiates an object that manages a connection pool. As you can see using a MySQLConnectionPool class, we can create a connection pool. mysql.connector.pooling.MySQLConnectionPool return a connection pool object. This class constructor takes pool_name, pool_size, database, username and password for creating a connection pool. So let see how to configure a connection pool using these arguments. pool_name: The pool name. As you can see we have given a pynative_pool as a connection pool name. If this argument not given, MySQL connector python automatically set name by other parameters like the host, user, and database. If multiple pools have the same name, then it is not an error. The application must create each pool with a distinct name. pool_size: a pool size is a number of the connection objects that pool can support. If this argument not given, the default is 5. Pool size cannot be 0 or less than 0.
pool_reset_session: Whether to reset session variables when the connection returned to the pool. a user, password, and database are additional connection arguments to connect MySQL. Now, Let’s see how to get a connection object from the connection pool and how to add new or existing connection object to the connection pool. Using a MySQLConnectionPool.add_connection() method we can add a new or existing MySQL Connection to the pool. If the pool is full or exceeding its limit, it raises a PoolError. Example of adding the MySQL Connection object to the pool. The connection_obj is the MySQL Connection object we want to add to the pool. If this argument is missing and the pool is not full, the pool creates a new connection and adds it. How to use the connection object from the connection pool? To request a connection from the pool, use MySQLConnectionPool.get_connection() method. Using this method application can get the connection object from a connection pool. Example to get Get Connection object from a connection pool. This method returns a connection from the pool. If all connections are in use or pool is empty it raises a PoolError. Using MySQLConnectionPool.set_config() Method we can set the configuration parameters for connections in the pool. i.e., we can reconfigure the connection object. When this method is called pool configuration is overridden, and any new connection requested from a connection pool start using the new parameters mentioned in MySQLConnectionPool.set_config() method. already running connection have no impact. Now, Let see how to use the pooled connection instance. Using the pooling.PooledMySQLConnection class, you can manage pooled connection instances. MySQLConnectionPool uses this class to return a pooled connection instance. Using pooling.PooledMySQLConnection class constructor, we can get a pooled connection. This constructor takes connection pool and connection arguments and returns a pooled connection instance. connection_object: A MySQL Connection instance. we can use a PooledMySQLConnection.close() method to close the pooled connection instance. This method doesn’t close the connection but returns the connection to the connection Pool to serve the next request. i.e., it returns a pooled connection to its connection pool. Example to close the pooled connection instance. Let see how to use all the methods that I mentioned in this article. As you can see in the first statement, we have imported 3 classes from MySQL Connector Python to create and manage the connection pool. import mysql.connector: Using this module, we can communicate with MySQL. from mysql.connector import Error: This module helps us to report any database exception that may occur during this process. Also we set connection pool name to “pynative_pool” and pool size=5, pool_reset_session=True. Next, we Printed connection pool properties. After this, we got a connection object from a pool and executed a MySQL query to fetch the database name from MySQL using a cursor object. In the end, we closed the connection instance. I have used the flow discussed here but every time a request comes a new pool is getting created. I wanted to use a common pool of connections to be shared between all user requests. Is there any solution in python as it seems Java do have.